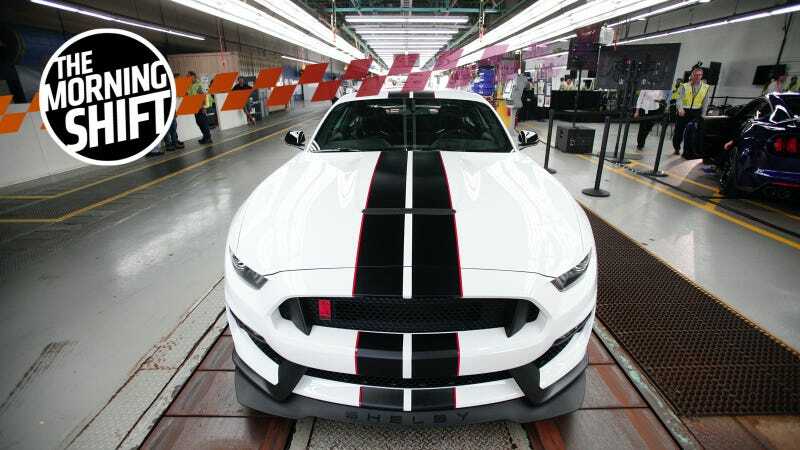 The Ford Mustang, built in Flat Rock, Michigan, is among the cars exported to China. One of President Trump’s campaign planks, and indeed, a plank of his presidency, has been to “bring manufacturing back” to the United States, especially automotive manufacturing and steel and aluminum manufacturing (both of which are vital to the car industry). Trade wars are “good” and “easy to win,” he proclaimed. To help bring that manufacturing back, the Trump administration announced a 25 percent tariff on $50 billion worth of Chinese goods, including cars. That felt good and nice, since the American market is already too flooded with Buick Envisions (4,367 sold last month, or less than 1.5 percent of GM sales according to Automotive News), Cadillac CT6 Plug-In Hybrids (17 sold, yes, seventeen, not 17,000), and Volvo S60 long-wheelbase models (doesn’t even register). China has taken aim at America’s rural heartland as the top buyer of U.S. soybeans said it would restrict imports. But that’s not so bad, right? I mean, who cares about soybeans? Dumb beans anyway. But again, who cares? This is a car website! It’s just affecting farmers. American car manufacturing is COMING BACK BABY. Just look at the full list that CNBC has generously compiled of products China is planning on slapping with 25 percent tariffs, NO CARS there, right???? Ah. And apparently a lot of American-made cars are exported to China. Over 100,000 from Mercedes-Benz and BMW alone, the Wall Street Journal says. BMW is staring down the barrel of a $965 million impact, Reuters reported. Welp. Supposedly this is just the opening round in the trade negotiations, and I’ve been told that trade wars are good and easy to win. The Board of Directors of Fiat Chrysler Automobiles N.V. (“FCA”) (NYSE: FCAU / MTA: FCA) announced today that it has authorized FCA management to develop and implement a plan to separate the Magneti Marelli business from FCA and to distribute shares of a new holding company for Magneti Marelli to the shareholders of FCA. The separation is expected to be completed by the end of 2018 or early 2019 and shares of Magneti Marelli are expected to be listed on the Milan stock exchange. Magneti Marelli has been owned by Fiat since 1967, and it had a turnover of €7.9 billion in 2016, with about 43,000 employees and 86 factories, according to the company website. There are a number of factors here, including the already-felt effects of Brexit and new diesel taxes, but it looks like Britain is going to be in rough shape for a while. The future of Vauxhall manufacturing was a little up in the air after Peugeot acquired the assets, but we’re glad to see it looks like it’ll still exist in some form. Neutral: Do You Work In The Automotive Industry? If so, what are your thoughts on the looming trade war? Hopes? Fears?